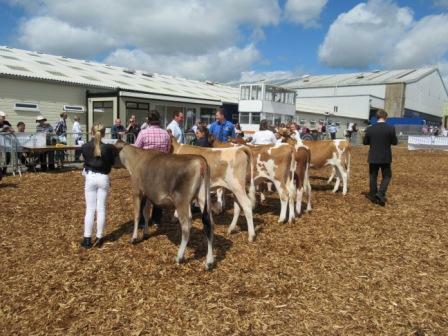 There were 16 cattle from 8 exhibitors forward at this years Royal Bath & West Show. 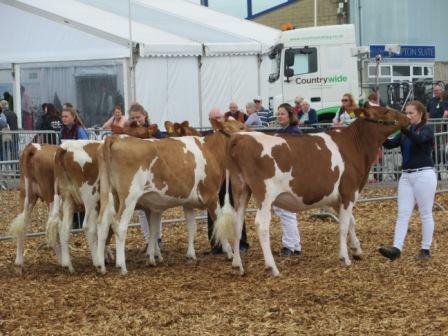 Unfortunately, only three of these were in milk and the Show Society had decided to amalgamate these into one class and they also did the same to the Heifer in Calf and Cow in Calf. This made for a difficult morning’s judging for James Warren. James eventually found his Champion in fifth calf Beechgroves Elinor 20 by Laredo from Digby Gribble, with the Heifer in Calf, Avalon Fernando Linda from Sales & Barnes in Reserve. Hon Mention went to Wiltown Latimer Patience from Brian and Sheila Adams. The Heifer Championship went to Avalon Fernando Linda, Best Udder to Avalon Pinto Fiona and the Tom Emm Points Cup to Brian and Sheila Adams. 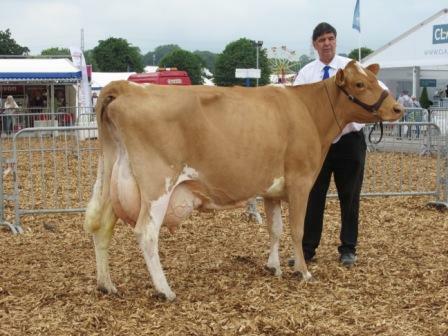 Champion Guernsey, Beechgroves Elinor 20. Reserve Champion and Champion Heifer, Avalon Fernando Linda. Hon Mention, Wiltown Latimer Patience. 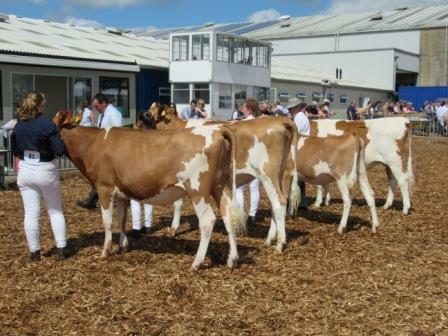 I had the pleasure of judging the Guernsey classes at this year’s Bath & West Show. My first class, heifer under 12 months, had 4 forward with a big difference in age and in 1st place I went for the baby in the class as an easy winner. 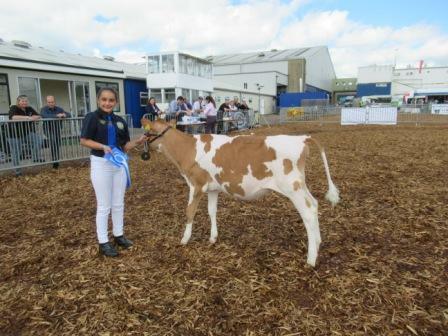 She is very dairy and has very silky skin and it was her dairyness and sharpness over the shoulder that put her over my second place heifer who was very correct and it was how she handled her legs that gave her the advantage over 3rd place. Third over four, was much closer but it was depth of rib that gave my third heifer the advantage. Maiden Heifer Under 12 Months. B & S Adams. Wiltown Latimer Patience. Rockett & Marshall. Trewey Legend Zela 20. B & S Adams. Wiltown Ernie Annie. B & S Adams. Wiltown Ernie Amy. 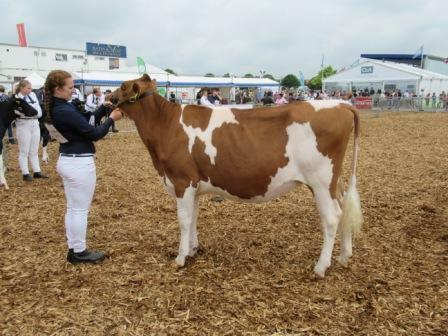 My second class, Maiden heifer over 12 months had five heifers forward and it was the overall balance and ring presence that gave my first animal the advantage over a very correct heifer in 2nd who had a great top line to be placed over my heifer in third. Third over four was much closer, but I felt she had the advantage in the rump over my 4th placed heifer who had a lot more power over my heifer in fifth. Maiden Heifer Over 12 Months. C. Huins. Vanda Lillian, by Hercules. R. Norman. Je Taime Double L Bijou. B & S Adams. Wiltown Latimer Joanne. B & S Adams. Briddlesford Levi Violet. Sales & Barnes. Hurdlebrook MLK Meadowsweet. 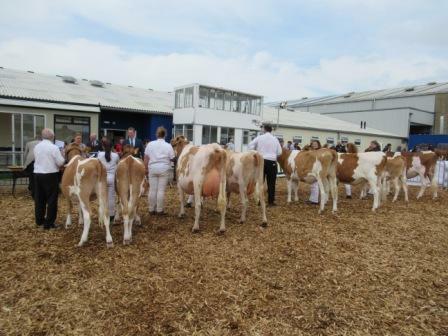 My third class saw the show combine two classes, (in calf heifer and cow in calf.) which I was not a great fan of doing. But there was an easy winner with an in calf heifer who was super dairy, walks on great legs and feet, has a beautiful rump and promise of a great udder and it was her dairyness that put her over a very correct dry cow who had more strength through her front end than my third placed heifer. Third over fourth was how she handled her legs. Sales & Barnes. Avalon Fernando Linda. R. Norman. Bourton Fiona 13 by Double L.
N & S Phillips. Burleaze Vampire Poppy. A. Marshall. Autumn Gold Trish by Legend. My fourth class saw three classes combined with three animals forward, each could have been a worthy class winner. I went for the senior cow having had 5 calves, she is very dairy and has a great ligament and she had the advantage of being a little stronger through the top than the heifer in milk who does have a super udder, which I gave Best Udder In Show and it was this super mammary that placed her over my Junior Cow. D. Gribble. Beechgroves Elinor 20 by Laredo. R. Norman. Avalon Pinto Fiona. B & S Adams. Wiltown Patience, by Alstar VIP. The winning group of three showed a little more dairyness than my second group and the winning pair were very well matched to win their class. In the Championship, I went with the Senior Cow having had 5 calves, she had proven herself but I was tempted to put the In calf Heifer up who stood Reserve as she looks to have a great future. Hon Mention went to my first class winner who I also think we will be seeing a lot of in the show ring. I would like to thank the Show for inviting me to Judge and all of the Exhibitors for bringing their animals to the show. 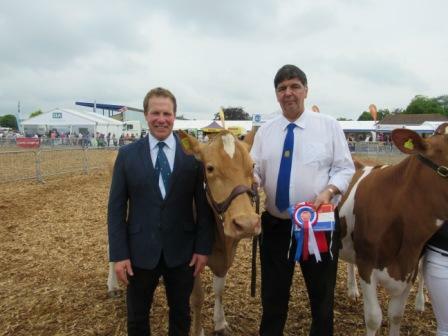 James Warren with Digby Gribble and Champion Cow. The second day of the Show saw the Interbreed Group classes that were judged by David Mann. 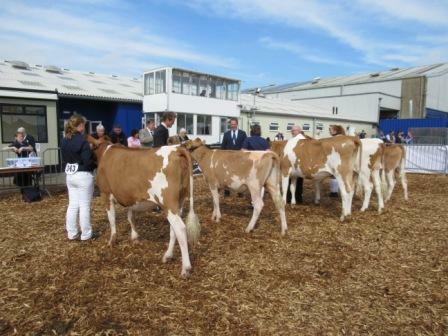 The Ayrshires dominated the top spots having enough milk cows to provide well matching groups. 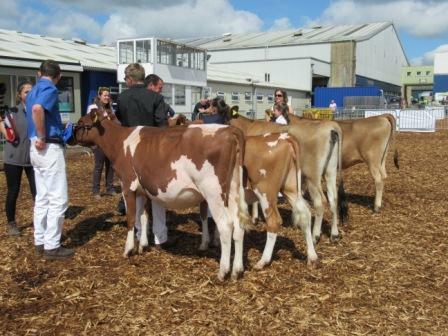 But the Guernsey Young Stock present put on a good show for our breed, gaining a reserve place for the Exhibitor Group of three owned by Brian and Sheila Adams. 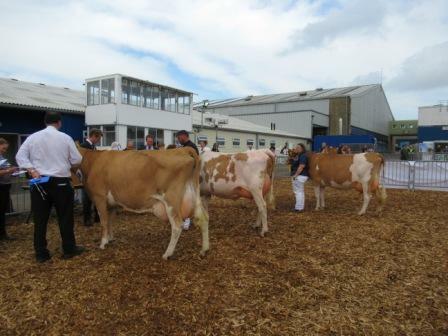 The Breed Society Group of Four was placed third but were a well matched group of promising Heifers. 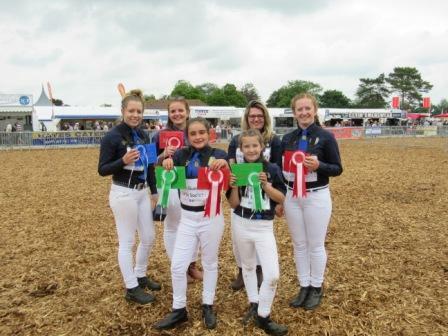 The Team Challenge followed where the Junior Team of Izzy and Hattie Phillips and Abi Marshall, and the Senior team of Heather Limond, Amber Craddock and Julles Rolle, represented the Breed well. Well done to all the young ladies who took part. 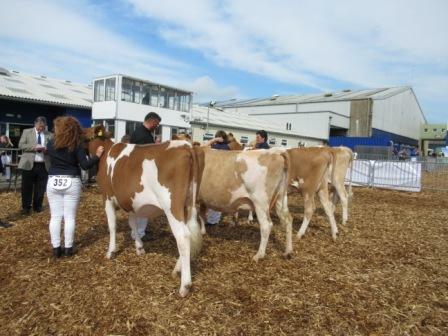 The Showmanship classes took place early afternoon and leading Guernsey calves were, Jasmine Wells, Hannah Garrett and Heather and Charlotte Limond. 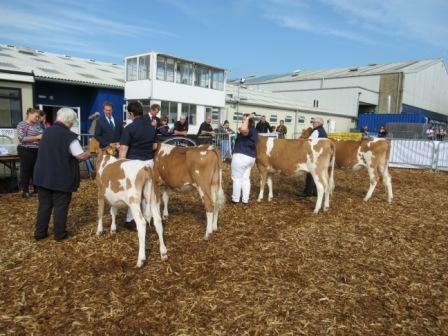 On the final day, the calf classes in which the Guernsey were in the Any Other Dairy Breed section, David Christophers placed the calves in the following order within their class. In the first class the only entry was Wiltown Latimer Patience from Brian and Sheila Adams. In the second class, Trewey Legend Zela 20 from Les Rockett and Tracey Marshall was placed second. In the third class, Richard Norman’s Je Taime Double L Bijou stood second with Wiltown Ernie Amy in third and Wiltown Ernie Annie in 5th both from the Adams’. In the final class, Vanda Lillian from Caroline Huins was second, Wiltown Latimer Patience from the Adams was third, Sales and Barnes’ Hurdlebrook MLK Meadowseet was 4th, with Briddlesford Levi Violet 2 again from the Adams’ in fifth. Congratulations to all Exhibitors and Handlers for a good entry in these classes and for their co-operation in a long and tiring Show!